own property, and caretake our wildlife and natural resources. 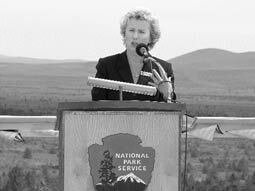 U.S. National Park Service Director Fran Mainella speaks to a crowd of about 200 people during a dedication ceremony for a new visitor's center at Lava Beds National Monument. Mainella sees a need for more community support in the National Park Service system. LAVA BEDS NATIONAL MONUMENT - The director of the U.S. National Park Service said Saturday that America's parks need more community support than ever, and credited local support as a huge factor in the construction of a new visitor's center at the Lava Beds. "About two years ago, we declared this as one of the top 12 projects for America's parks," said National Park Service Director Fran Mainella, speaking to a crowd of about 200 people Saturday morning. "It's finally being able to achieve its completion," she said. "It's also a great example of people being able to work together." The National Park Service is being challenged this year with finding a way to serve an ever-growing mass of visitors while trimming budgets. Since the terrorist attacks of Sept. 11, 2001, Mainella said, more and more people have been coming to national parks and exploring their heritage. Mainella said "the welcome mat is out" at America's 388 parks, and called the Lava Beds a "crown jewel" of the parks system. Lava Beds Chief Ranger Terry Harris said several ranger positions will go unfilled this season, but said volunteers will enable the park to keep up most its services. Harris said the biggest hit is in the interpretive division, which leads tours, staffs the visitor center and runs campfire programs. "In essence, we're down two positions right now, but we're going to be able to maintain the bulk of our services," he said. "The things that people come for, the cave tours - we're going to provide." Harris said the unfilled ranger positions will be supplemented with three student conservation aides. The aides, which are primarily college students doing internships, will be guaranteed at the park this year, where in previous years it depended on program funding. "We looked at our program and figured out: What does the public really want and need?" he said. Mainella's visit Saturday marked the first time any parks director had visited in an official capacity. She said she enjoyed touring Mushpot Cave on Friday, but said in a Saturday interview she couldn't possibly pick just one cave from the park system as her favorite. Lava Beds National Monument completed its visitors' center in August for a total cost of $2.1 million - about a million dollars under budget, which officials credit to help from community groups and widespread support and donations. The last exhibit went up in the center three weeks ago. "The biggest thing is the public was part of the design of this," Mainella said. "We didn't do this in isolation; this is exactly what we want to see in our national parks." Saturday, about a dozen groups, including representatives from the Klamath Tribes, cave exploration societies, civil war re-enactor societies and a smorgasbord of government entities, showed up to celebrate the opening of the new visitors center and caves research facility. Klamath Tribes chairman Allen Foreman, said the new visitors center represented a new direction of cooperation between the U.S. government and the tribes. "To the Modoc people, the area around the Lava Beds is their natural environment," he said. "This was their way of life." The crowd was then treated to a drum ceremony with traditional American Indian dancing. Other speakers included Cindy Wright, executive director of the Tulelake-Butte Valley Fair, Janet Sowers, president of the Lava Beds Cave Research Foundation, Tulelake elected official Randy Darrow and Lava Beds National Monument Park Superintendent Craig Dorman.